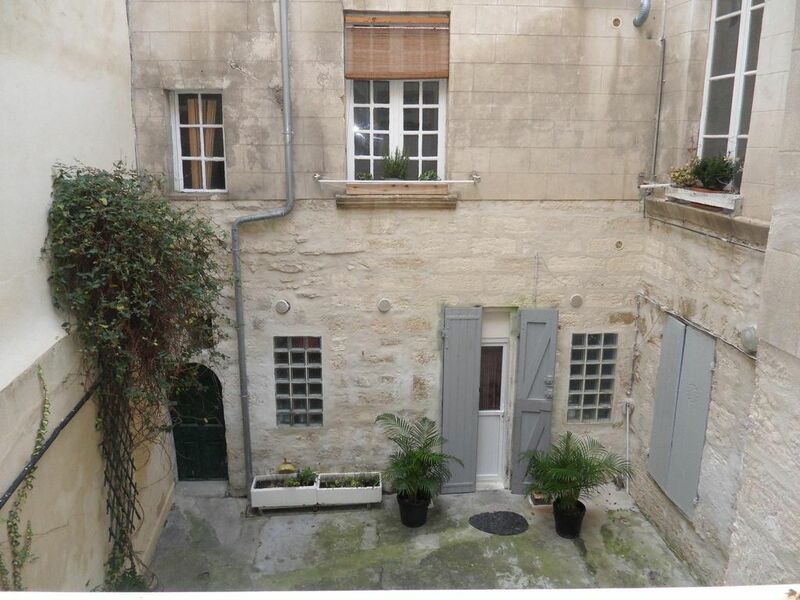 At the heart of the town of Avignon, 100 m away from the Place Pie and the Halles, an exceptional apartment of 72 sqm, with a lots of style, on the 1st floor of a very quiet ancient building. Put into service from June 2012 it can welcome up to 6 persons in optimal conditions of comfort. Boast all the mod cons, you will find everything you expect from a luxury rental (cleanliness, quiet, comfort, sky television, WiFi, washing machine, equipped kitchen, new and comfortable bedding...). Ideal location to visit Avignon, its museums and all its architectural treasures. Many tourism excursions can be done in the surroudings, less than 1h away by car, with your vehicle or with the local tour operators (Pont du Gard, Uzes, Nimes, Arles, Camargues, Luberon, Orange, Saint-Remy-de-Provence, Chateauneuf-du-Pape, etc. Staying in this roomy, moderized apartment that is set in a 16 th century building was perfect. The size was more than the 2 of us needed but was extremely welcomed after our tiny tiny place in Paris. It was clean and away from the busy tourist area , yet a 3 minute walk to the center of everything Annick and Gerard were gracious helpful and lovely. Annick welcomed us there and arranged for one of the nicest cab drivers in france to take us to the Garre Centre Avignon. The Only critcism was that we had the windows open at night and were swarmed and bitten by mosquitos while we slept. Would perhaps suggest deet or a net for our next August visit. Spacious apartment in a tremendous location. Ambience of the apartment was stark but adequate but this was made up for with a convient location and spaciousness. We had a great time in Avignon, thanks to Gerard & Annick. The apartment is in a great location in the heart of the old city. we could walk to everything! The apartment is spacious, well maintained, and well equipped. Annick was waiting for us when we arrived and helped us feel comfortable. We rented a car a couple of days to get to Saint Remy, Cassis, etc. Avignon is a delightful town and close many interesting locations, Travel tip: Avignon has 2 main train stations: City Centre and TGV on the outskirts. City Centre is more convenient but the TGV has better service throughout France. there is a "shuttle" train that goes between City Centre & the TGV station every 30 minutes, sometimes more frequent & only 1.60 Euro. very easy to get back & forth. the rental car locations are mostly at the TGV station. it was very easy to take the shuttle from the center to the TGV station to pick up a rental car and/or connect with another train. Last October my husband and I stayed here for 4 nights which was our first visit to Avignon. The apartment was a little difficult to find at first walking there from the bus station but once we settled in and acclimated to the location, we were fine. The restaurants, markets and major tourist sights were within walking distance so we enjoyed all that we could. The apartment was quite spacious and comfortably furnished. The kitchen was well equipped and bright due to the big windows overlooking the courtyard and the appliances worked fine. It was always a quiet place to which to return after a busy day. We enjoyed visiting the Palais des Papes, Pont d’Avignon, Calvet and Angladon Museums. Our two favorite restaurants were L’Offset and Fou de FaFa. We were sorry that we were not able to meet the owners since they were away but we do thank them for our stay. The shame was this place could have been great with very little effort from the landlord - who was very nice and helped us with our luggage. The apartment is very nice. The location is great. What keeps it from the "A" list are the lack of amenities. No phone; very little toilet paper; very little in the kitchen - no coffee, no olive oil, no seasonings; washing machine but no soap; no hand soap in the bathroom. The book about the apartment had instructions but no recommendations for things to do or restaurants.